Looking for some free and fabulous classroom posters for your middle or high school classroom? Finding lots that are geared towards elementary students? Well... I've been looking too and have found a lot of great finds that I thought I could share with all of you. I've been checking out blogs lately and noticing the fantastic amount of work that goes into setting up an elementary school classroom- the themes and ideas that some people have are amazing!! Never mind, the hours of time and the hundreds of dollars that have been spent on each room. As a high school teacher who shares a room with another teacher (I think this is common in High School as many of us in my school teach in several different rooms) it can be hard to "decorate" a classroom to appeal to both teachers and students. I have posted some subject specific posters in my room, but I also like to include some fun quote posters, some inspirational posters and some academic posters. Thankfully, we live in the world of the internet and there are literally 1000s of ideas and examples available for FREE. Here are a few of my favorite places to find some FREE and fabulous posters for your classroom. Venspired Blog has a fabulous set of FREE posters on her Flickr stream that she encourages you to download and use in your classroom. Krissy Venosdale has designed them all herself and they're beautiful!! You can print them at home or have them printed at a local print shop for brighter colors. (I'm going to print a few a my local print shop this year and put them in inexpensive frames - can't wait!!) Her blog is amazing and one of my favorites!! Technology Rocks. Seriously - Love, love, love the posters on this great blog. They're colorful, but still printer ink friendly and will look great in any classroom. I have several sets of FREE posters in my TpT store - click to download a set of "The Outsiders - Quote Posters", "Types of Sentences" or check out my newest set pictured below! Six posters to highlight six subjects! Click the image to grab a set! Teachers Pay Teachers - I just did a quick search for "posters" and then narrowed the search by clicking on "free" and there were over 5000 options for 6th-8th grade alone!! Use the search features to narrow it down even further. EdGalaxy - I recently discovered this website with some fabulous FREE posters & resources covering a wide variety of subjects and grade levels. ELA, Science, Geography & more!! There are close to 50 free posters on this website! Common Sense Media - wow... they have some fantastic social media and digital citizenship posters that I'm going to put up in my room this year. 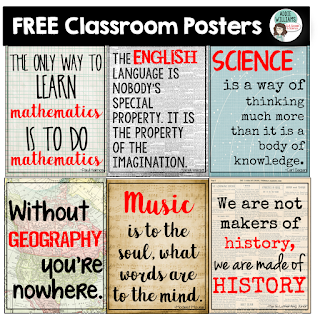 Here are a few more places to grab some awesome posters for your classroom! Check out the posters at Light Bulbs and Laughter, Teach Junkie, and these great ones from Edutopia. Have fun printing out and putting up posters! If you have a favorite free poster website please leave the links in the comments below. Thanks! I am all things obsessed with chalkboard theme this year. I teach upper elementary gifted students so I created some famous quotes posters to hang in my classroom. You can download them for FREE from this link http://www.teacherspayteachers.com/Product/Chalkboard-Style-Classroom-Quotes-Posters-795025. Hope you like them! Thanks so much for posting the link Sidney! I'll have to check them out! What font are you using with the lines? KG Second Chances Sketchy - one of my new favorites! !